The Meyer Lemon is believed to be a "cross" between a regular lemon and a mandarin. These lemons tend to have a more smooth and "rounder" texture than your average lemon variety. Meyer Lemons were discovered in China, brought to America and seemingly ever since, Chefs and great cooks everywhere have rejoiced! With their sweeter, less tart and abundant juice content, it is no wonder even the Famous of the Famous T.V. Chefs and Cooks sing high praises for the Meyer Lemon. 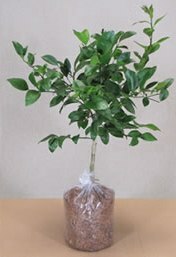 As a tree...with its colorful fruit, fragrant blossoms, and glossy evergreen foliage, the Meyer Lemon will make a memorable addition to your home or yard.